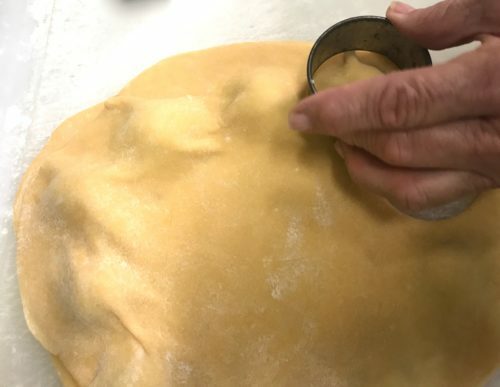 When Lucia makes homemade pasta she makes it rustic, only with her hands and a rolling a pin. No pasta machine. The steps for this pasta are easy, but you need time. 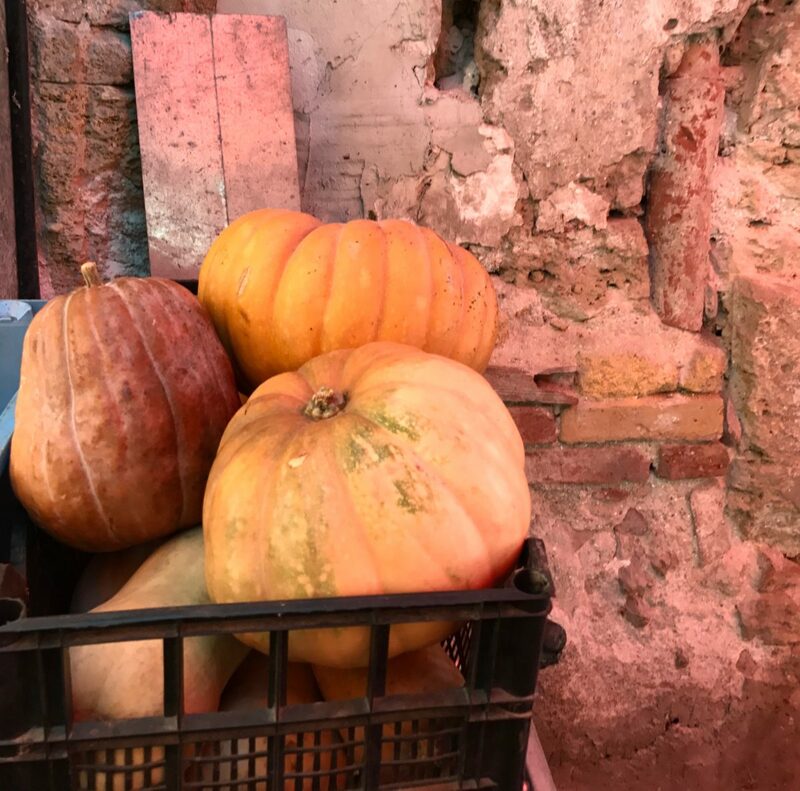 So relax, call for your Italian soul and welcome Lucia’s way to make a wonderful homemade meal. You can easy make this pasta vegetarian. 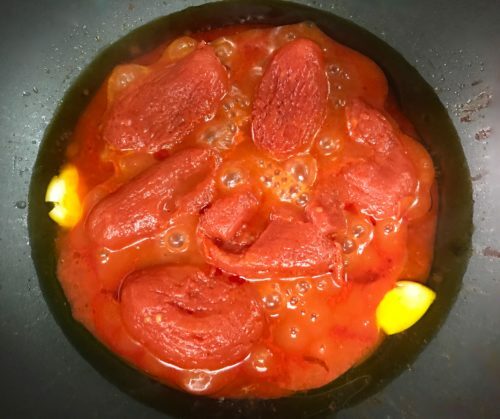 Add one more mushroom to the filling and some spices to the tomato sauce to depend the flavours, as a bay leaf, a pinch of dried chili or thyme. Cook the potato for the filling. Make the tomato sauce. Let simmer. Make the pasta dough. Let rest. 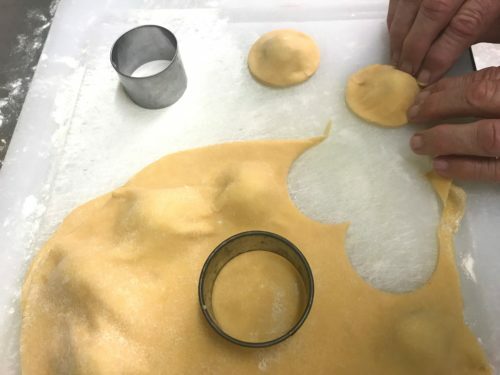 Make the filling for the ravioli. Make the beef ready and add to the tomato sauce. 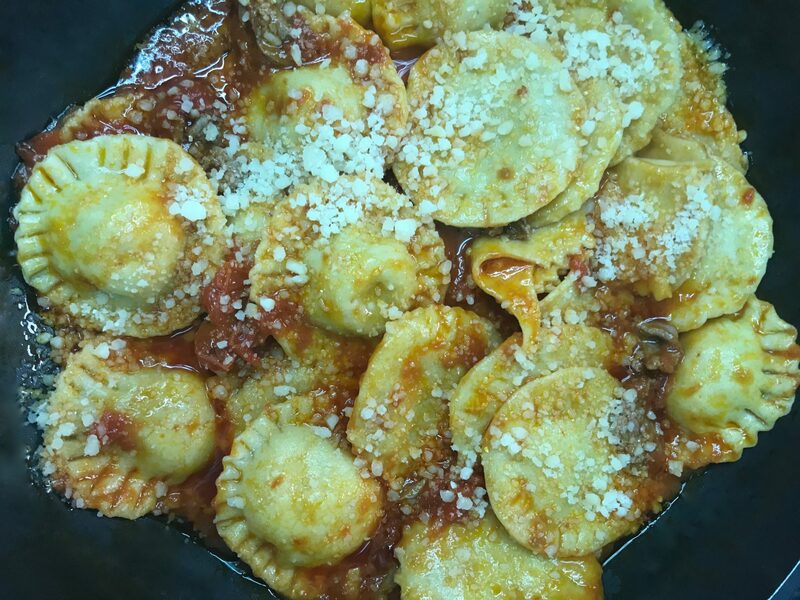 Have the ravioli in the beef & tomato sauce. Put the garlic cloves in a large pan with 3 tablespoons of extra virgin olive oil. Heat gently. Add the tin of whole tomatoes into the pan. Stir and turn down the heat. Put the lid on and cook on low heat for 20 minutes. Crush the tomatoes with a fork. Add salt, pepper and 1 teaspoon sugar. When the sauce is cooked, remove the garlic. Or, if you love garlic, leave them in, as garlic-heaven surprise. Pound the beef flat and tender. 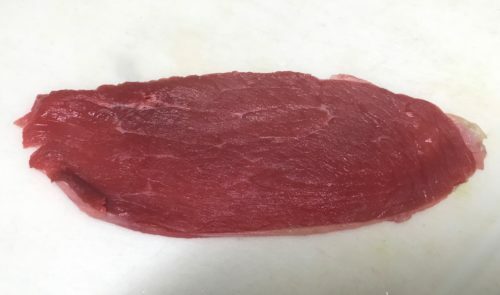 A nice thin piece of beef meat. Make thin shreds of the meat and add to the sauce. Boil the potato and let cool down. 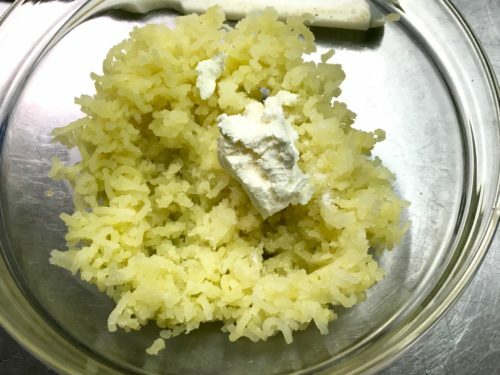 Mash it and have in a bowl. Add mascarpone, salt and pepper and blend gently. 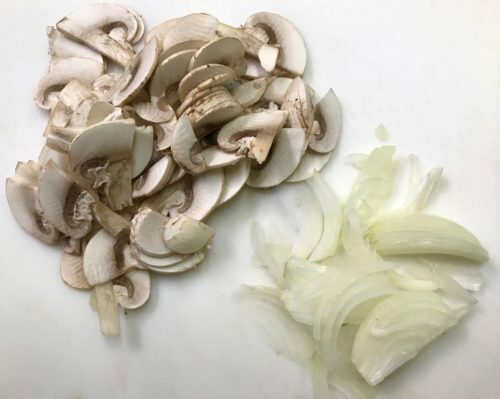 Finely slice mushrooms and onion. Finely sliced mushrooms and onion. Remove the fat on the cured ham and slice it. 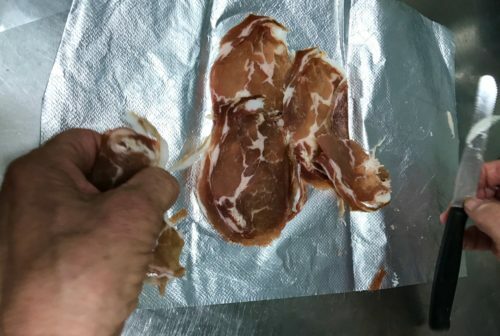 Remove the fat from the edges on the cured ham. 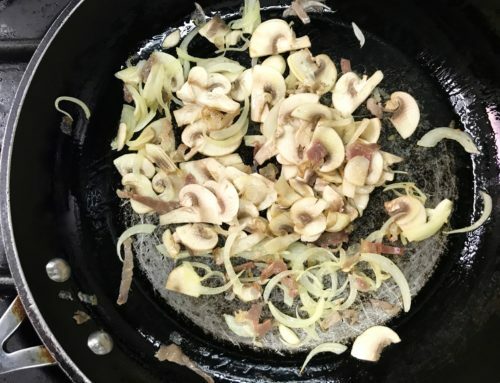 Heat a pan, add olive oil, onion, mushrooms and cured ham. Cook gently for some minutes. Onion, mushrooms and cured meat in the pan. Add white vine and let simmer for 5 minutes.  Mix the fried onions, mushrooms and cured meat in to the mashed potato and mascarpone with a fork. Taste the filling and add with salt and pepper if needed. Add the eggs and mix together with a fork. Mix the flour and eggs. Add a pinch of salt and olive oil. When the dove is soft, firm it as a ball. 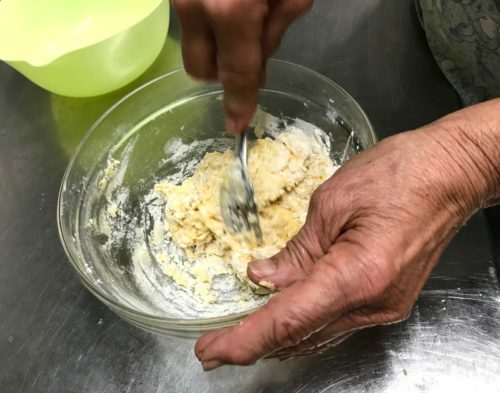 Divide it in 2 parts and knead for a while with your hands. If the dove is sticking to your hands add a little more flour, but be careful to stop adding flour as soon as it stops sticking. Knead the dough until smooth and even. 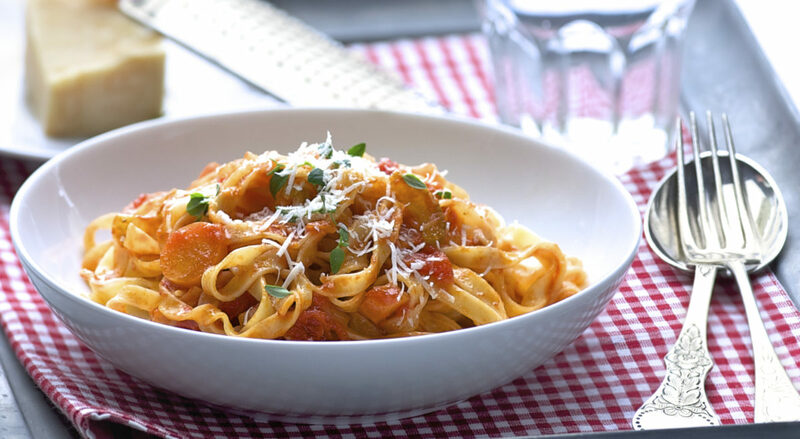 Leave the pasta to rest for at least 20 minutes under a kitchen towel or cling film. At this point the dove can rest up to 1 day in wrapped cling film. 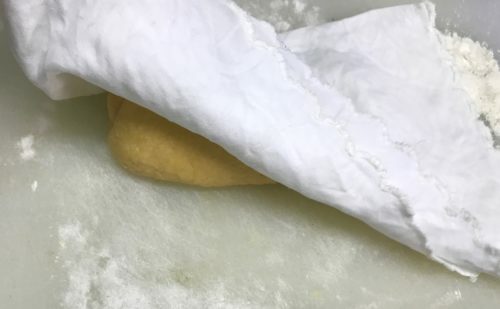 Let the pasta dough rest under a kitchen towel. Dust the work surface with flour and divide the pasta dough in 3. 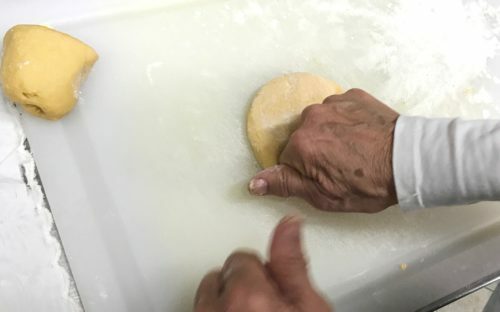 Roll the dough into thin sheets. 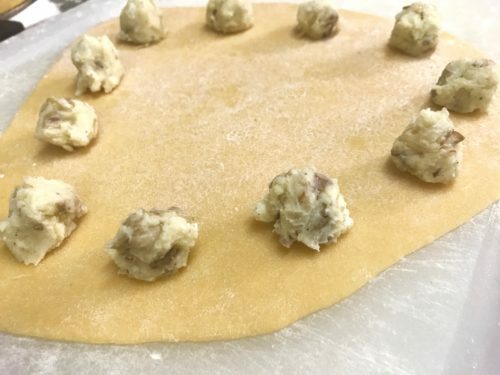 With a rolling pin roll the pasta doughs out to 3 thin sheets. 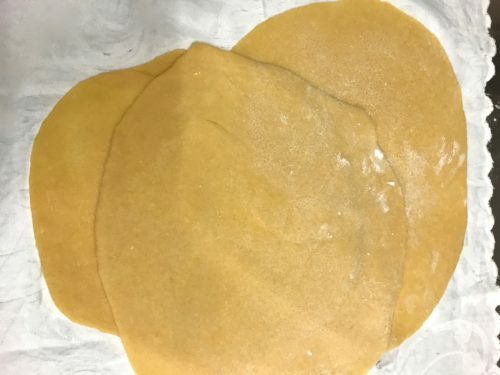 3 rustic made pasta sheets. Put small dots of the filling in a line on the pasta sheet, spacing them 1 inch apart. Filling in a line on a pasta sheet. Brush with beated egg round the dots of filling. Lay the second layer of pasta sheet on top. Press around the filling to expel air. Cut around the fillings with a cup, a knife or a wheel. 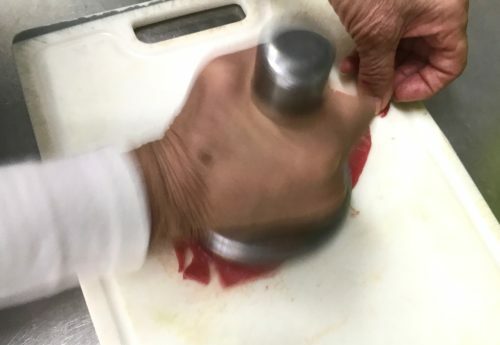 Press the edges of the ravioli to seal well. 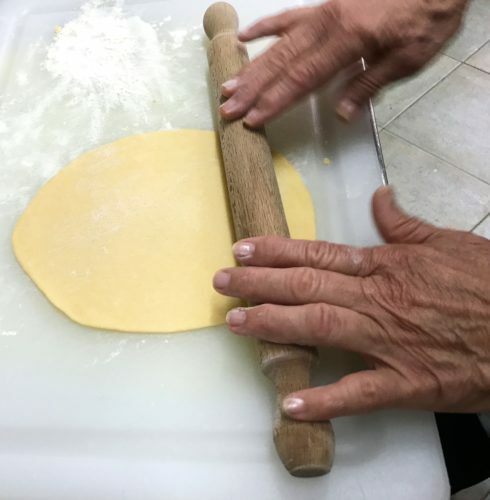 Press and seal the ends of the ravioli. 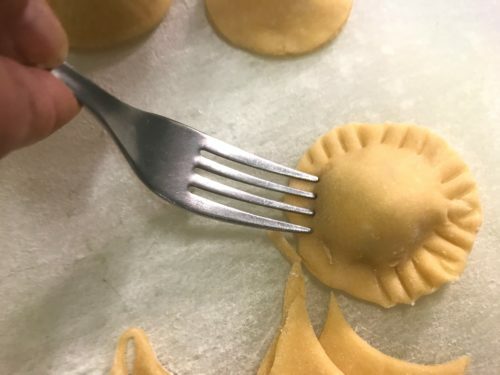 Seal the edges of the ravioli with a fork. Seal the edges with a fork. 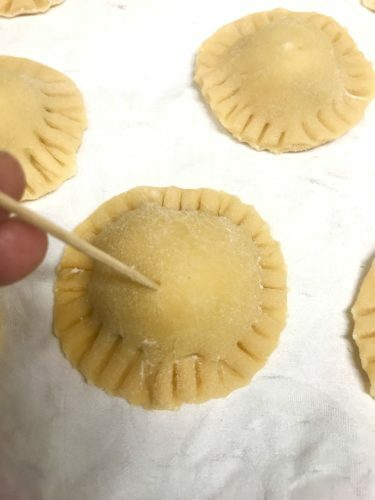 Stick a hole with a toothpick on the top of the ravioli to expel air. Stick a hole with a tooth pick. Gather up all the trimmings. Re-roll and repeat together with the 3 pasta sheet. 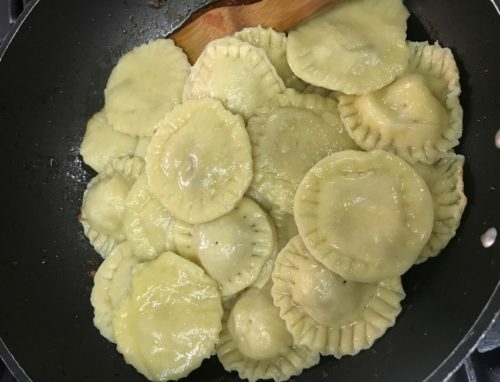 When you have made the ravioli, save the trimmings and let them cook as pasta with the ravioli. 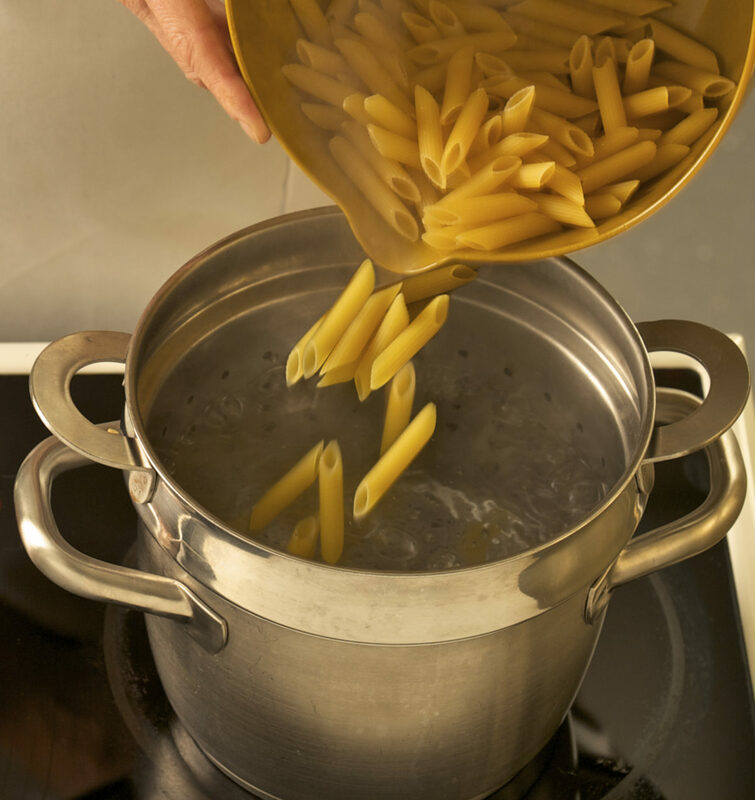 Bring a large pan with salted water to boil. Drop in the ravioli and the excess trimmings. Meanwhile warm the beef- and tomato sauce. Reserve 1/2 cup pasta water, and add to the sauce. Blend and let simmer for 2 minutes. Garnish with a generous amount of grated parmesan. With minced ginger & chili flakes.